Gliders are a unique mode of transportation and once you master their use, they’re fun and very effective. You’ll find gliders placed all over New Eden, and you can even get portable gliders to use out in the wilderness. To use a glider pad, simply stand on it, or run across it. Holographic wings will appear from your character’s back, and you’ll be thrown up in the air. You’ll immediately start gliding forward, so be prepared! You steer by using the mouse, but you don’t need to press any buttons. You’ll need to angle slightly downwards – if you stay level or point upwards, you’ll start to stall. When you stall, you’ll dip downwards and then level out. This will repeat indefinitely, costing you a lot of altitude, until you lower your angle enough to stop stalling. Steady careful adjustments are best rather than rapid movement. Swooping downwards while gliding helps you pick up speed fast, at the expense of gliding time due to loss of altitude. 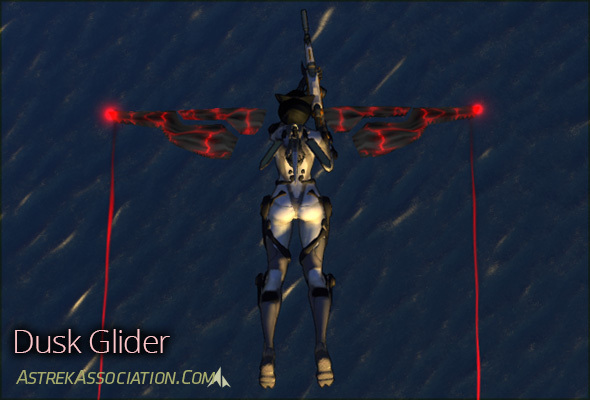 Occasionally something goes wrong and you’ll plunge straight downwards; adjusting your angle won’t help you level out of this dive, but you can sometimes salvage the glide by tapping shift to reset your glider wings. If you use spacebar it will deactivate your glider wings and activate your jumpjets, allowing you to smoothly gain height, although you can’t then restart your glider wings without using another glider pad. Hitting a surface or object turns your glider off. Note that these are new controls; previously gliders were reset by tapping spacebar, and you couldn’t go straight from gliding to jumpjetting. Experienced gliders will have some reflexes to relearn! You can still use your abilities in flight, including firing your weapons. You just have to be very careful about aiming without crashing. It’s worth hopping on glider pads at the watchtowers to practise glider movement, because once you’ve got the hang of it, gliding is a very effective way of getting all over New Eden. Note that this video was taken before the new gliding altitude/angle indicator appeared in the UI; this new UI feature makes it much easier to keep your glide angle correct. In addition to the permanent gliders, you can also get portable glider pads you can carry with you. You can deploy these using your calldowns menu, and place them on any flat surface. They’ll last for a short amount of time, so other people nearby can also use them. See “Types of Glider Pads” below for more information. Abilities that push you in a particular direction will usually work when you’re gliding, but only some will synergise well with gliders. You can use Afterburner (Accord Assault) and Inferno Dash (Firecat) to boost yourself up or forwards very fast. This is a great way of gaining altitude on a glider – angle your camera upwards, trigger Afterburner or Inferno Dash, and then immediately adjust your angle so that you don’t stall. It’s possible to glide from the top of Thump Dump all the way to Sunken Harbor using this trick. You can also use Burn Jets to gain a lot of altitude at the start of your glide: point your camera up into the sky and step onto the glider pad; then immediately use Burn Jets. Burn Jets will save you from stalling, and will cause you to lift straight upwards until they wear off – just make sure that you’ve adjusted your camera angle to the proper gliding angle before they wear off, to avoid stalling when your glide resumes. This technique may require a little practise to perfect, but it’s worth the effort as it’s very handy. Emergency Response (Dragonfly) will lift your altitude slightly and thus extend your glide, but only by a small amount. Evacuate (Recluse) should not be used; it will turn you to face the camera and you’ll likely lose altitude and probably stall when recovering. Teleport Shot (Mammoth) is situationally useful. If you’re in an unrecoverable dive, you can shoot your Teleport Shot at the ground (provided you’re in range) to land safely and instantly. However, if you’re gliding normally and shoot it at a nearby cliff face, you’ll teleport to the cliff face and then fall, with your glider deactivated. Charge! (Rhino) does not affect gliding speed. Engineer frames don’t have any abilities that affect gliding one way or the other. You can deploy your Teleport Beacon ability (Raptor), hop on a glider pad, and then trigger the beacon – you’ll reappear at the beacon’s location, still gliding. This has limited application, but can sometimes be handy to get past obstructions. You can use Mosquito Wings to substantially lift your altitude at the start of your glide, just like Assault Burn Jets. See the Assault section for the technique. There are a range of glider pads available to players. Here’s a rundown of each type. They all function the same way; they differ only in duration, cooldown and appearance. These gliders can be found all around New Eden (and there are also a few in the Melding Pockets). Each Watchtower has at least one, and you’ll also find them around towns at points of high elevation. These are the “standard” glider wings, and many of the portable gliders look the same. Source: Turn On The Lights! achievement (visit and activate each SIN tower in New Eden). This looks the same as standard glider wings. The recipe for this item is found in the printer, under Build > Consumables > Deployable Glider Pad. You can print batches of up to 10 at a time. This glider pad is available from 10-14 February 2014, for Valentine’s Day. It does not currently share a cooldown with any other glider pads, although this may change. Cost: Free with any purchase of Red Beans during August/September 2013. Source: Automatically given on next login after purchasing Red Beans. This glider pad shares a cooldown with the Sunrise, Dusk, Emerald and Topaz glider pads. It is no longer available. Cost: Free with $20+ purchases of Red Beans during October 2013. This glider pad shares a cooldown with the Sunset, Dusk, Emerald and Topaz glider pads. It is no longer available. Cost: Free with $20+ purchases of Red Beans during November/December 2013. This glider pad shares a cooldown with the Sunset, Sunrise, Emerald and Topaz glider pads. It is no longer available. Cost: Free with $20+ purchases of Red Beans during January/February 2014. This glider pad shares a cooldown with the Sunset, Sunrise, Emerald and Dusk glider pads. Cost: Free with $20+ purchases of Red Beans during March 2014 – available for limited duration. This glider pad shares a cooldown with the Sunset, Sunrise, Topaz and Dusk glider pads. Great guide, didnt know that tapping space resets it. Engineer – (Bastion which I main): You can set some turrets down near a thumper then activate/use a Glider and this will initiate the ‘Bomber’ achievement when your turrets start killing tangos. There is also a addon called GliderHelper. I use this and since I installed it I purchased the 50 RB Glider as Gliding is so much fun and easy now. It shows a small UI feature with arrows which indicates the perfect levelling for maximum glide. Thankyou for the reminder about GliderHelper! I’d actually meant to discuss addons in the guide – I’ll amend it as soon as I get a chance. Thanks for the guide! I didn’t know abut using Assault abilities to jet yourself higher. Is there any performance difference at all between the various different gliders? I have the Adventurer’s and the Crystal Wing, and I feel like I can’t get as far with them as with standard wings. No, they’re all the same as far as I know – they’re just reskins of the standard pad, the way all the bikes have the same mechanics too. There is a new glider with red bean purchase for some time! Yep; it was introduced a couple of days ago. We’ll be updating the guide shortly! This glider looks like Angel Wing now. The Sunset glider does, yes. I suspect it’s a bug, though. 1. share the same cooldown rendering it inneffective to get more than one? 2. have separate cooldowns like the Tigerclaw “Trailblaze” ability? That’s a clever trick with teleport shot – I hadn’t thought of using it that way! Regarding duplicate glider pads, I am fairly sure they’ll share the same cooldown, but I don’t have any duplicates so I can’t say definitively. As for Evacuate, you can indeed use it to extend a glide if you are careful; we added a caveat in the guide as it’s easy to cause yourself problems with camera reversal. That’s not correct; the Red Bean glider pads share a cooldown as well. This is confirmed by FadedPez’s post here. I also find that if you look up when you first step onto the glider pad and then look down after your wing appear, you will increase the initial altitude of the start of the glide. I have found that I can get a lot further doing this than if I don’t. It takes a little practice because if you don’t look back down quick enough you will loose your wings and fall to the ground. Yeah – that’s actually easier with the new glider-launch camera, I think, though I don’t like that camera much for other reasons. Yep! We don’t have a shot of it yet because it’s apparently using Diamondwing artwork – that should be fixed shortly, hopefully! it has a separate cooldown? Celestial Wings have been added as well! Would love some basic info + anything on drop chances to go along with it. Arsenal Rocket Jump ability is very usefull to keep altitude. I made Fortaleza/Northern Shores/Fortaleza/Sunken Harbor/Copa/O Cogumelo without landing without this ability.